Population growth: The population in the ECOWAS¹ region is projected to almost double over the next 15 years, from 230 million in 2010 to 430 million by 2025 (source FAO, 2010). Such growth is expected to put immense pressure on the ability of West African agriculture to meet the growing demand for food staples and maintain stability in domestic and regional food security systems (source IFPRI, 2011). West Africa continues to attract large investments from international agribusiness groups like Olam, Cargill and Sime Darby in such cash crops as cocoa, cashew, cotton, rice or rubber. 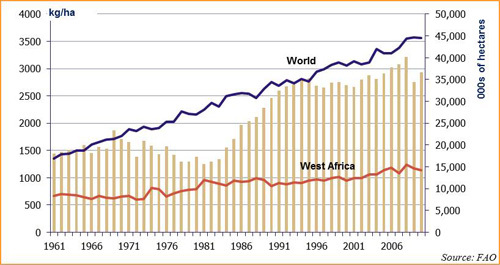 Pressing need to boost local production and improve food security: Africa is a net food importer. In 2007 Africa's agricultural imports exceeded agricultural exports by about USD 22 billion (source FAOSTAT, 2011). In Mali, about 27% of the population is food insecure and poverty incidence remains high at 47.5% (in 2006). Empirical results show that a 25% increase in food prices---the average price of rice in the country increased by about 20 to 25% in 2008---led to an increase in poverty by 1.7%, equivalent to nearly 300,000 additional people falling into poverty (source FAO). With its agricultural regions located along the Niger River, a domestic source of natural phosphate rock would offer a transformative economic fertilizer and potential additional export product. Starting in 2008/09, the Government of Mali launched a large fertilizer subsidy program for rice producers. Since the 2009/2010 planting season, the subsidy also covers other crops such as cotton, wheat and maize. The subsidy program was part of the Government’s response to the 2008 increases in cereal prices but it also constitutes a structural measure to increase production and make Mali a net cereal exporter. In addition to the subsidy, the Malian Government Rice Initiative program also supplies machinery, seeds of improved varieties and additional technical assistance for producers. With Great Quest's high grade phosphate priced at $450 a tonne, farmers can get a $300 subsidy. However, the company is currently in talks to get the subsidy moved in line with that of the DAP fertilizer subsidy. If this is achieved, the farmers will be subsidized for 100% of the cost of Great Quest's product as it costs less than the current subsidy on a 50kg bag of DAP. The present use of fertilizers in Sub-Saharan Africa is only about 9 kg/ha of arable land, compared to a world average of 101 kg/ha. According to Lennart Båge, President of IFAD², "increasing fertilizer use in Africa is crucial both for eradicating rural poverty and increasing agricultural production."